Greetings my fellow gamers and Star Wars fans. Welcome to another week of Force Lore! While we celebrate the coming of Game Update 1.2, getting closer to release each and every day, we have to take a moment of silence for the departure of a dear friend to the Star Wars community, Ralph MacQuarrie. The man that was responsible for designing Darth Vader, Chewbacca, and so many of the sets that brought the original trilogy to life will be missed. Ralph was responsible for conceptual artwork on Battlestar Galactica and E.T. the Extra-Terrestrial also. Ralph passed on to become one with the Force on March 3, 2012, at the age of 82. “May you live long and prosper, may you always find shade, and may the Force be with you, always.” The Science Fiction world will miss you, Ralph. Thank you for the lives you touched through your work. The week is dedicated to Mr. MacQuarrie. Without him, our beloved Star Wars Universe would look quite different. While some of his conceptual work was changed to fit into the original trilogy, a lot of Ralph’s work would make it’s way into the Expanded Universe of Star Wars. In Star Wars: The Old Republic, some of those conceptual designs can be seen, from the Sith Imperial Trooper design to the architecture of the Hutts. Ralph’s vision of the space environments of Star Wars can be seen influencing the opening Flashpoint for the Republic, The Esseles. So, strap in to your acceleration couch and let’s jump to this destination! The Republic’s counterpart to the Imperial Flashpoint, The Black Talon, is the low-level group instance, The Esseles. We covered Black Talon last week and now it’s time to show the Republic some love. Entry level to The Esseles Flashpoint is7 to 10, while most of us will be experiencing this content between levels 9 and 11. 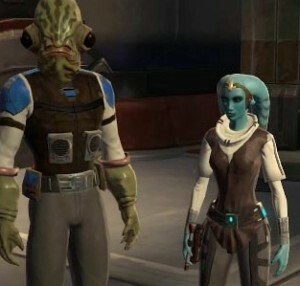 One of the things I neglected to mention last week is that The Black Talon and The Esseles are great beginning opportunities to interact with other players and experience the Social Points mechanic of SWTOR. Interacting with NPCs during the course of the Flashpoint gives you the chance to make decisions on how the course of the story of the instanced area goes. By choosing Light Side options or Dark Side options, you will determine how events unfold, either more “good guy” or adding a darker flavor. This can also determine which encounters you may find on your path. While in a party, each player gets to choose their choice of responses while interacting with NPCs during story arcs. These choices are assigned a roll score, much the same way that Need/Greed rolls are randomly determined for loot. Characters also get bonuses based on their interactions which can lead to scores of 130 to 150+. Making your choice during interactions is time-sensitive, though, and you can be penalized if you fail to make a choice in time. These penalties can carry over into future NPC conversations in the Flashpoint, resulting in low scores even when your “roll” for conversation choice was 100. Arriving at Carrack Station at the Republic Fleet, you will get the option to pick up the quest that will put you on board the Wanderer-class transport, The Esseles. The Wanderer-class appears to be very similar to the Thranta-class cruiser in design, but without the armaments, just like the BT. (The Thranta-class is named for the avian creatures that are used for public transport on Alderaan.) Just like the Imperial instance, your character gains passage on this vessel to travel to the Republic faction capital of Coruscant. You can go slow and be safe, or you can be a true hero and take the fast transport that will put you right in the thick of danger. It’s a game, so I’m sure you’d rather be fighting through waves of mobs as opposed to being safe. If you wanted to be safe, you’d play The Sims™. On board the Esseles, you’ll encounter Ambassador Vyn Asara, a Twi’lek diplomat that the Empire has taken special interest in. There’s not a lot of history behind this character. But she’s a focused individual who is concerned with completing her duties. The whole “the needs of the many outweigh the needs of the few” attitude is very obvious with her, especially when she’s willing to sacrifice crew to obtain success with her mission. The Empire wants our dear Ambassador and the Imperial that is spearheading their endeavors is none other than good ole’ Grand Moff Rycus Kilran, the same uppity guy that sends players after the Brentaal Star in the Black Talon Flashpoint. The “Butcher of Coruscant” wants Asara and commits an Imperial battle cruiser to accomplish this. With the attack on the ship under way, the players journey to the bridge, finding that the captain has been killed and that First Officer Haken has taken command of your transport. He knows he’s out-matched by the Imperial warship and it’s up to you, the players, to even the odds and score a win for the Republic. Of course the players will score the win. That’s what heroes do. But that task isn’t going to be easy. I’ll admit that I was impressed with this fight. I ran BT numerous times and it was a cakewalk. 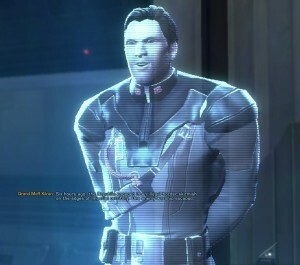 But the boss fight on the Esseles bridge with the Mandalorian Ironfist was not my first time through. We were not prepared. Lacking a healer, we struggled and wiped twice before the two Jedi characters finally prevailed and burned him down. Ironfist is a mobile, merciless, boss that will inflict damage if you’re not paying attention. He has a nice knockback along with his heavy-hitting arsenal of weapons. But once you down him, the table begins to turn, in favor of our heroes. The Imperials have the Esseles in a tractor beam. And just like Episode VI, you have to knock out that tractor beam in order to save the ship and the lives on board. 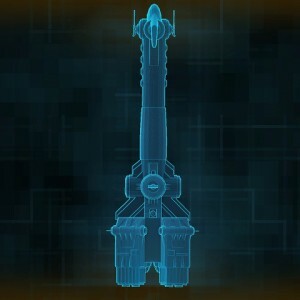 This means taking a shuttle over to the Imperial warship and shutting it down. You also have the choice to take Ambassador Asara with you and leave her on the Imp ship after you complete your mission. On board the Imperial vessel, you face off against two droid bosses before the beam is shut down and you can leave. Moff Kilran is taunting you quite a bit also, telling you that your actions are hopeless and that you should just surrender. That, of course, is not an option. What fun would that be? Making it back to your shuttle, the epic-ness rises a level as you have to face a true Sith. Lord Vokk, a Sith Marauder, is determined to stop your escape. This Sith brings some Area of Effect abilities along with a rather mobile attack style. He doesn’t like to stand still. If you don’t pay attention to where you’re standing, you’ll soon feel the power of the Dark Side as he drops Lightning Storm circles randomly throughout the encounter. Otherwise, pour on the damage and get out of dodge before the Moff can make good on his threats of your demise. If you choose to leave the Ambassador behind, perhaps you’ve succumb to your emotions and are starting down the dark path. My experience has been to save her in a noble, honorable fashion, rather than falling into “a Sith way of thinking.” You escape on board your shuttle, return to the Esseles, and the day is saved. Onward to Coruscant. Just like the Black Talon, there’s not a lot of backstory to go along with this Flashpoint. It’s just a good introduction for Republic faction players to experience instanced, group, gameplay. It also does a good job of immersing the player into the Star Wars universe and the conflict between the Republic and the Sith. All the elements of the movies are there and it paves the way for these upstart Republic characters to become galactic heroes.